Rambling Rican: So excited.. for Sasuke 23! September 11 - Added official TBS page for Sasuke 23 Confirmed the All-Stars (minus Bunpei) and Yuuji as a shoe salesman.. Added All-Star photo and added Ube's blog contributions). September 13 - Added another name Ube found. September 14 - Added more from Ube. September 16 - Added more from Ube. September 19 - Added more from Ube. Sasuke 23 is right around the corner! It's just over TWO WEEKS AWAY! Just like last year.. I've been chanting this song LOL. Looks like there will be a bunch of us in the Sasuke Maniac forums waking up at early morning (6:00 AM Eastern time) on Sunday, September 27th to watch Sasuke 23 air live (****please see the post I created for viewing options****). Showtime is 3 hours and 54 minutes! Again just like last year Lost in Ube (his Sasuke 23 list is here) and I will be scouring the Internet to find what we can. With Sasuke Maniac off the air.. we have to rely on blogs, websites, etc. to find out our information! As of today we have a few people already confirmed and/or rumored to be coming, PLEASE NOTE: These names, even the confirmed one, can change due to unforeseeable circumstances - so the list is created as a guideline using past information and what has been posted in blogs in Japan. It is for fans wanting to know who might be participating. Yuuji Urushihara 漆原裕治 - Shoe salesman (UNCLI #3) who qualified for Sasuke 21 via BUG-IN-MIKI win against the All-Stars. He re-qualified through Sasuke Trials Spring/2009 and made it to the final stage in Sasuke 22 (he is also featured in this official Sasuke 23 poster). American Ninja Warrior (previous American Ninja Challenge (ANC) so this would techincally be ANC5)/G4: 10 ANW winners (names are being withheld because ANW is airing in the USA in December, 2009 (yes.. you read right.. 3 months after we find out who they are in 2 weeks during the official TBS broadcast.. yeah.. retarded.. I'm digressing aren't I?). G4 will be sending 2 hosts that are not competing. They are Alison Haislip and Blair Herter. Jewelry designer Ryk Maverick is in Japan for SASUKE. 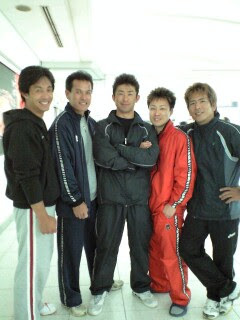 Sasuke Trials Fall/2009 - We hear there are 6 winners that survived the event this year. Itou Yoshiki 伊藤圭槻, 17, of Noboeka City 延岡市. The winner of the Miyazaki Beach Sports Number One competition. Kohei Satomi 里見恒平 - Football player. He's been on Sportsman No. 1 more than a few times. Jordan Jovtchev - Bulgarian 5 Time Olympian and previous Sasuke competitor (Finalist in Sasuke 8 and lastly competed in Sasuke 20). According to Kazuha Sakiyama 崎山一葉 boy band Shinsengumi Rien 新撰組リアン were at the taping but I have no idea how many of them participated. Muscle Musical (each year they have a long list of competitors from this Monster 9 created show). It is unknown how many of these will show up since some of the regulars are still in Muscle Musical Las Vegas. Daisuke Miyazaki 宮﨑大輔 (and most likely his previous handball teammates Iwanaga Sho 岩永生 and Masakatsu Izuma 猪妻正活) Daisuke has signed on with a new handball team in Spain. He has games this same weekend in Spain and it is very unlikely he will take off for Sasuke. Not confirmed but it's a safe bet he may not be able to participate. I can't wait! Since it's airing on a Sunday, I might actually get to watch it. I'd have to get up at 5:00 AM (eek!) but I think it would be worth it. It would end around 8:55 AM my time, and we usually leave for church at 8:45, so I may miss the last 10 minutes. I can see that on your blog, though. I really hope all 6 All-Stars compete, and that they all clear the first stage. That's only happened twice, in the 11th and 12th tournaments. And I'd REALLY like to see Yamada and Yamamoto go all the way. Ganbatte kudasai! Yes! Definitely worth it. Hope everyone keeps up on the viewing options. I heard you guys in Webjam had an awful time with KeyHole. I'm hoping you all get to enjoy the broadcast in a better connected program. So far TVAnts is doing great and I'm hearing rumors of LiveStation though I think people had a rude awakening when it stopped airing TBS early in the day.. I'd still do my best to get TVAnts up and working. Hopefully with the amount of commercials they put in the later half of the broadcast you can get to change clothes and get ready before leaving for church! Glad at least you can see it! Good work Ube and RR!! Guess the qualifiers have been put on gag order... so sad that more of them don't get to go on. LOL about G4 airing their qualifier... WTF?? Yes.. after I started reading about the failed runs from Sasuke Trials from various blogs I was getting depressed :( I hope M9 asks those who did well in Muscle Park events like Kawaguchi and Matachi to go anyway if they didn't get passed trials. I sure as heck Kanno didn't have to qualify.. that .. would be retarded..
And yes.. wtf G4.. they have to be idiot to expect people not to know who's going to Sasuke 23 from ANW after the TBS broadcast.. good.. lord.. So yes.. the G4 Broadcast is December.. that's 3 months from now.. December?! G4 stinks! And you know they'll cut a lot of the good "behind-the-scenes" stuff. Stupid G4! At least this time I'll get to see the original Japanese version. It'll give me a chance to practice my limited Japanese. Yeah, I should get to see most of it. Since I keep my laptop in my room, I can do most of my getting ready while watching the show. I can take my laptop into the dining room while I have breakfast. I'm really looking forward to this! That's cool you will get to see it. Mental note.. They have something called Sasuke Navi. That's the 1 hour preview where they do a bunch of interviews and whatnot with whoever is going to appear in the show. Personally I like it just as much as the actual competition since you usually see where they live and stuff. This is tentatively scheduled the same day. 2 pm their time so that's like midnight for you.. I'll post it when I get the TBS confirmation on that. So far I'm hearing 2 different times though Sato's page has 2 pm their time. Let's see if it's official soon. ghaaargh I'm starting to shake when I read "Sasuke 23". I'm really lucky for once. Living in Italy, I'll only have to be ready for 11 am. I'll go to church in the evening. I'll see Sasuke Navi on your blog. I need to download a program to watch TBS on. Which one is best, how do I download it, and what is VLC? VLC is another program like Window Media Player (though for me I like it better since it does a lot more formats that Windows sometimes doesn't like and it also gives you the ability to record). Added a pic that has Akiyama in it AND I read in the TBS site that he is confirmed. LOL and you lucky for being in Italy! Oh don't forget Sasuke Navi! Serious fangirling opportunities await! I have Windows Media Player on my laptop. Will it work for watching TVAnts, or do I need VLC, specifically? TVAnts has to be installed on your computer. You can watch it directly from there without ever using VLC. If you wanted to record it.. that's where VLC comes into play. If you are just watching though and don't plan to record (trust me there will be people recording if you want a copy later) just stick to getting TVAnts up and running. I do encourage you to check the boards though. They are a heck of a lot smarter than I am when it comes to this stuff and it will always have the latest information as to any new programs that might work better. Thanks. Yeah, Shingo's hair looks better when it's shorter. He can keep it long and it'll still look neat, but it definitely looks better short. Remember in Sasuke 13 when he had his hair down to his shoulders? His hair was longer than his wife's! I didn't think it looked good when he had his hair that long. This style looks better on him. Torisawa is not a comedian by the way..he's just a dude who crushes fruit. BTW-- this is a long time coming, but I started a facebook group for Sasuke, and the majority of the information and pictures are stolen from your blog (with links to it, of course). If that's not ok, let me know and I'll take everything down. LOL not at all :) Happy more people get to see the show because of it :) Appreciate the link backs :) Which one is your page? I don't have facebook but would be cool to see it if it's public. Sasuke has a crapload of Russian fans! Correction: Maybe Slavic would be a better term than Russian (my knowledge of europe is pretty limited). I just joined the Sasuke fansite on Facebook. I love the pictures! There are two I'm wondering about; the one of Nagano on the motorbike and the one of Shingo on the exercise equipment. I haven't seen either of those before. Where'd they come from? And when was the one of Nagano taken? Thanks. That's cool. In that pic Nagano was the same age I am now. Too bad about Bunpei (seemingly) not being in. He'd tear through the course, I'd think.